Have you heard anyone say, “I don’t read the Bible because it is filled with judgment”? Well, let’s talk about that. 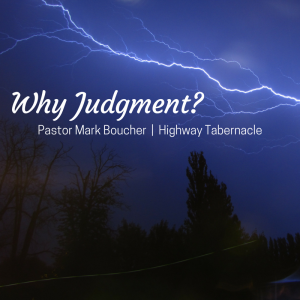 Yes, judgment of various types is recorded in the Bible. For example, the Book of Jeremiah is filled with warnings about coming judgment. In Jer. 18:11, we read, “Now therefore say to the people of Judah and those living in Jerusalem, ‘This is what the Lord says: Look! I am preparing a disaster for you and devising a plan against you.’” So, why would God threaten to prepare disaster? First, we must understand something about Jeremiah’s ministry. He was called as a prophet to warn God’s people, Israel, about the consequences of sin. Jeremiah preached and prophesied about 50 years, showing that God is extremely patient! Furthermore, God spoke through Jeremiah on several occasions about His willingness to turn from judgment if the people would respond with repentance. Continuing on in Jer. 18:11, we read, “So turn from your evil ways, each one of you, and reform your ways and your actions.” Sadly, their response was, “It’s no use. We will continue with our own plans; each of us will follow the stubbornness of his evil heart” (v.12). Even after God’s repeated warnings, the people continued to follow their evil inclinations. As a result, God judged Israel through Babylon. He removed His hand of blessing and protection, allowing the nation of Babylon to invade and destroy the land of Judah. The Bible reveals that God never enjoys judgment, but does allow people to experience the consequences of sin. But, you might ask, “What about us as believers in Jesus?” Yes, Jesus died on the cross and took the judgment for our sins! By trusting in Jesus, we relate to God as our Father and not as our Judge. This amazing truth should humble us and create in us a heart of worship and gratitude! However, we must never presume that Christ’s death gives us an excuse to pursue evil. To truly love Jesus means we learn to hate sin.